Definition at line 30 of file CModelMerging.h. Definition at line 28 of file CModelMerging.cpp. Definition at line 448 of file CModelMerging.cpp. References CModel::createCompartment(), CModel::getCompartments(), CCompartment::getDimensionality(), CModelEntity::getInitialValue(), CModelEntity::getKey(), CCopasiObject::getObjectName(), CModelEntity::getStatus(), keyMap, mmModel, mpModel, nameMap, CCompartment::setDimensionality(), CModelEntity::setStatus(), and CCopasiVector< T >::size(). Definition at line 478 of file CModelMerging.cpp. References CModelEntity::ASSIGNMENT, copyExpression(), copyInitialExpression(), CModelEntity::FIXED, CKeyFactory::get(), CModel::getCompartments(), CModelEntity::getInitialExpression(), CModelEntity::getKey(), CCopasiRootContainer::getKeyFactory(), keyMap, mmModel, CModelEntity::ODE, and CCopasiVector< T >::size(). Definition at line 75 of file CModelMerging.cpp. References CCopasiVectorN< CType >::add(), C_INVALID_INDEX, copyDelayExpression(), copyEventAssignmentExpression(), copyTriggerExpression(), CModel::createEvent(), CEvent::getAssignments(), CEvent::getDelayAssignment(), CEvent::getDelayExpressionPtr(), CModel::getEvents(), CEventAssignment::getExpressionPtr(), CCopasiVectorN< CType >::getIndex(), CCopasiObject::getObjectName(), CEventAssignment::getTargetKey(), CEvent::getTriggerExpressionPtr(), keyMap, mmModel, mpModel, CEvent::setDelayAssignment(), CEventAssignment::setTargetKey(), and CCopasiVector< T >::size(). Definition at line 530 of file CModelMerging.cpp. 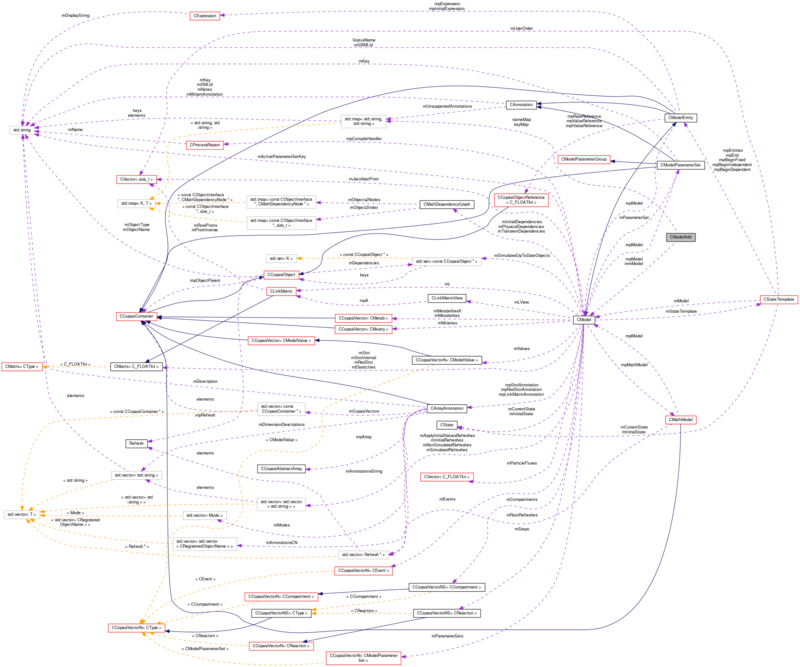 References CModel::createMetabolite(), CMetab::getCompartment(), CMetab::getInitialConcentration(), CModelEntity::getKey(), CModel::getMetabolites(), CCopasiObject::getObjectName(), CModelEntity::getStatus(), keyMap, mmModel, mpModel, nameMap, CMetab::setStatus(), and CCopasiVector< T >::size(). Definition at line 562 of file CModelMerging.cpp. References CModelEntity::ASSIGNMENT, copyExpression(), copyInitialExpression(), CModelEntity::FIXED, CKeyFactory::get(), CModelEntity::getInitialExpression(), CModelEntity::getKey(), CCopasiRootContainer::getKeyFactory(), CModel::getMetabolites(), keyMap, mmModel, CModelEntity::ODE, CModelEntity::REACTIONS, and CCopasiVector< T >::size(). Definition at line 616 of file CModelMerging.cpp. References CModel::createModelValue(), CModelEntity::getInitialValue(), CModelEntity::getKey(), CModel::getModelValues(), CCopasiObject::getObjectName(), CModelEntity::getStatus(), keyMap, mmModel, mpModel, nameMap, CModelEntity::setStatus(), and CCopasiVector< T >::size(). Definition at line 645 of file CModelMerging.cpp. References CModelEntity::ASSIGNMENT, copyExpression(), copyInitialExpression(), CModelEntity::FIXED, CKeyFactory::get(), CModelEntity::getInitialExpression(), CModelEntity::getKey(), CCopasiRootContainer::getKeyFactory(), CModel::getModelValues(), keyMap, mmModel, CModelEntity::ODE, and CCopasiVector< T >::size(). Definition at line 696 of file CModelMerging.cpp. References CReaction::addModifier(), CReaction::addParameterMapping(), CReaction::addProduct(), CReaction::addSubstrate(), CReaction::clearParameterMapping(), CModel::createReaction(), CReaction::getChemEq(), CModel::getCompartments(), CReaction::getFunction(), CReaction::getFunctionParameters(), CModelEntity::getKey(), CChemEqElement::getMetaboliteKey(), CChemEq::getModifiers(), CChemEqElement::getMultiplicity(), CCopasiObject::getObjectName(), CReaction::getParameterMappings(), CReaction::getParameterValue(), CChemEq::getProducts(), CModel::getReactions(), CChemEq::getSubstrates(), CReaction::isLocalParameter(), CReaction::isReversible(), keyMap, mmModel, CFunctionParameter::MODIFIER, mpModel, CFunctionParameter::PARAMETER, CFunctionParameter::PRODUCT, reactionInvolvesCompartment(), CReaction::setFunction(), CReaction::setParameterMapping(), CReaction::setParameterValue(), CReaction::setReversible(), CFunctionParameters::size(), CCopasiVector< T >::size(), CFunctionParameter::SUBSTRATE, CFunctionParameter::TIME, CFunctionParameter::VFLOAT64, and CFunctionParameter::VOLUME. Definition at line 224 of file CModelMerging.cpp. References CKeyFactory::get(), CCopasiObject::getCN(), CEvent::getDelayExpressionPtr(), CEvaluationTree::getInfix(), CCopasiRootContainer::getKeyFactory(), CEvaluationTree::getNodeList(), CCopasiContainer::getObject(), CEvaluationNodeObject::getObjectCN(), CCopasiObject::getObjectDataModel(), CCopasiObject::getObjectName(), CCopasiObject::getObjectParent(), CCopasiObject::isReference(), keyMap, mmModel, CEvaluationNode::OBJECT, CEvaluationNodeObject::setData(), CEvent::setDelayExpression(), CEvaluationNode::type(), and CEvaluationTree::updateTree(). Definition at line 168 of file CModelMerging.cpp. References CKeyFactory::get(), CCopasiObject::getCN(), CEventAssignment::getExpressionPtr(), CEvaluationTree::getInfix(), CCopasiRootContainer::getKeyFactory(), CEvaluationTree::getNodeList(), CCopasiContainer::getObject(), CEvaluationNodeObject::getObjectCN(), CCopasiObject::getObjectDataModel(), CCopasiObject::getObjectName(), CCopasiObject::getObjectParent(), CCopasiObject::isReference(), keyMap, mmModel, CEvaluationNode::OBJECT, CEvaluationNodeObject::setData(), CEventAssignment::setExpression(), CEvaluationNode::type(), and CEvaluationTree::updateTree(). Definition at line 336 of file CModelMerging.cpp. References CKeyFactory::get(), CCopasiObject::getCN(), CModelEntity::getExpressionPtr(), CEvaluationTree::getInfix(), CCopasiRootContainer::getKeyFactory(), CEvaluationTree::getNodeList(), CCopasiContainer::getObject(), CEvaluationNodeObject::getObjectCN(), CCopasiObject::getObjectDataModel(), CCopasiObject::getObjectName(), CCopasiObject::getObjectParent(), CCopasiObject::isReference(), keyMap, mmModel, CEvaluationNode::OBJECT, CEvaluationNodeObject::setData(), CModelEntity::setExpression(), CEvaluationNode::type(), and CEvaluationTree::updateTree(). Referenced by addCompartmentsExpressions(), addMetabolitesExpressions(), and addModelValuesExpressions(). Definition at line 392 of file CModelMerging.cpp. References CKeyFactory::get(), CCopasiObject::getCN(), CEvaluationTree::getInfix(), CModelEntity::getInitialExpressionPtr(), CCopasiRootContainer::getKeyFactory(), CEvaluationTree::getNodeList(), CCopasiContainer::getObject(), CEvaluationNodeObject::getObjectCN(), CCopasiObject::getObjectDataModel(), CCopasiObject::getObjectName(), CCopasiObject::getObjectParent(), CCopasiObject::isReference(), keyMap, mmModel, CEvaluationNode::OBJECT, CEvaluationNodeObject::setData(), CModelEntity::setInitialExpression(), CEvaluationNode::type(), and CEvaluationTree::updateTree(). Definition at line 280 of file CModelMerging.cpp. References CKeyFactory::get(), CCopasiObject::getCN(), CEvaluationTree::getInfix(), CCopasiRootContainer::getKeyFactory(), CEvaluationTree::getNodeList(), CCopasiContainer::getObject(), CEvaluationNodeObject::getObjectCN(), CCopasiObject::getObjectDataModel(), CCopasiObject::getObjectName(), CCopasiObject::getObjectParent(), CEvent::getTriggerExpressionPtr(), CCopasiObject::isReference(), keyMap, mmModel, CEvaluationNode::OBJECT, CEvaluationNodeObject::setData(), CEvent::setTriggerExpression(), CEvaluationNode::type(), and CEvaluationTree::updateTree(). Definition at line 898 of file CModelMerging.cpp. References CReaction::getChemEq(), CChemEq::getModifiers(), CChemEq::getProducts(), CChemEq::getSubstrates(), and CCopasiVector< T >::size(). Definition at line 33 of file CModelMerging.cpp. Definition at line 39 of file CModelMerging.cpp. References addCompartments(), addCompartmentsExpressions(), addEvents(), addMetabolites(), addMetabolitesExpressions(), addModelValues(), addModelValuesExpressions(), addReactions(), CModel::compileIfNecessary(), CCopasiMessage::ERROR, fatalError, CModel::getKey(), keyMap, MCModelMerging, mmModel, and mpModel. Definition at line 42 of file CModelMerging.h. Referenced by addCompartments(), addCompartmentsExpressions(), addEvents(), addMetabolites(), addMetabolitesExpressions(), addModelValues(), addModelValuesExpressions(), addReactions(), copyDelayExpression(), copyEventAssignmentExpression(), copyExpression(), copyInitialExpression(), copyTriggerExpression(), and simpleCall(). Definition at line 69 of file CModelMerging.h. Referenced by addCompartments(), addCompartmentsExpressions(), addEvents(), addMetabolites(), addMetabolitesExpressions(), addModelValues(), addModelValuesExpressions(), addReactions(), copyDelayExpression(), copyEventAssignmentExpression(), copyExpression(), copyInitialExpression(), copyTriggerExpression(), setModel(), and simpleCall(). Definition at line 68 of file CModelMerging.h. Referenced by addCompartments(), addEvents(), addMetabolites(), addModelValues(), addReactions(), setModel(), and simpleCall(). Definition at line 43 of file CModelMerging.h. Referenced by addCompartments(), addMetabolites(), and addModelValues().